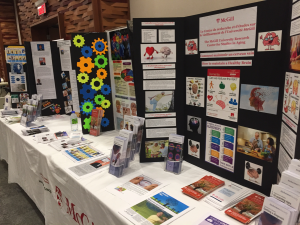 The McGill University Research Centre for Studies in Aging (MCSA) participated for the first time at the 3rd Annual McGill Employee Health Fair on Friday, October 25, 2013. The event began at 11:00 am and ended at 2:00 pm. Target audience consisted of McGill employees and McGill students. Our booth displayed many posters, and handouts/flyers on dementias, and on various diseases on aging. Our team shared their knowledge with participants by engaging them in a MOCA test, inviting them to challenge their brain with various tests using P.O.N.D.E.R and MCSA Nurse took vital signs and answered health-related questions. This fair was an excellent opportunity to gain exposure and to provide awareness to the McGill community of what the MCSA Centre offers and services that we provide. Details of the other editions of the health fair are as follows. October 31, 2014 – Time: 11:30 a.m. – 2:30 p.m.